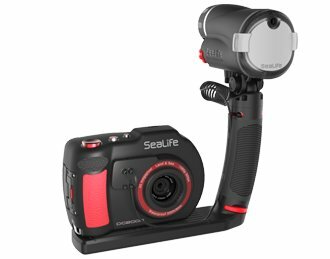 Reducing backscatter and capture vibrant colors in underwater photos, the Sea Dragon Flash, Flex-Connect Single Tray, and Grip easily attach to the DC2000 in seconds. Variable power adjustment and large controls of the Sea Dragon Flash make it easy to fine tune brightness, while leaving the flash in Auto Mode automatically adjusts brightness for optimal exposure. A quick-release button detaches flash head for aiming in hard to reach areas. The Sea Dragon Flash makes it simple to add light to your images down to 200 feet/60 meters. The included diffuser increases beam angle to 100° by 100°.